A trend I’ve been obsessing over this summer? Tropical prints. I’m a little late at jumping on this bandwagon as the blogosphere has been blowing up with Tropical goodness all season, but better late than never! I’ve been getting better at shopping in my own closet and have been bringing out so many oldies but goodies. This tropical print Hollister dress was my favorite 4 years ago, as I adored the print and comfy fit. I haven’t worn this dress in probably 2 years and was excited to rediscover it this week. I liked the idea of putting a t over it and belting the ensemble. I decided to mix prints but stick to a similar color so the overall effect wasn’t too obnoxious. Conclusion? I’ve found my new favorite tropical ‘skirt’! Love all the color in this outfit! I'm a new follower! love your blog, very good job! Seriously, can you be any cuter? Love this entire outfit. Love this look! Followed you back dear! love this outfit, the colours look so good together! and you look so pretty in these photos! i love that print! it looks good with your top! I love tropical prints! 🙂 You look stunning! I mean legs for days much? 😉 Love your blog, now following on GFC and Bloglovin! Lovely, you are so beautyful. I jealous 😉 Your outfit is great. Follwing you as well. 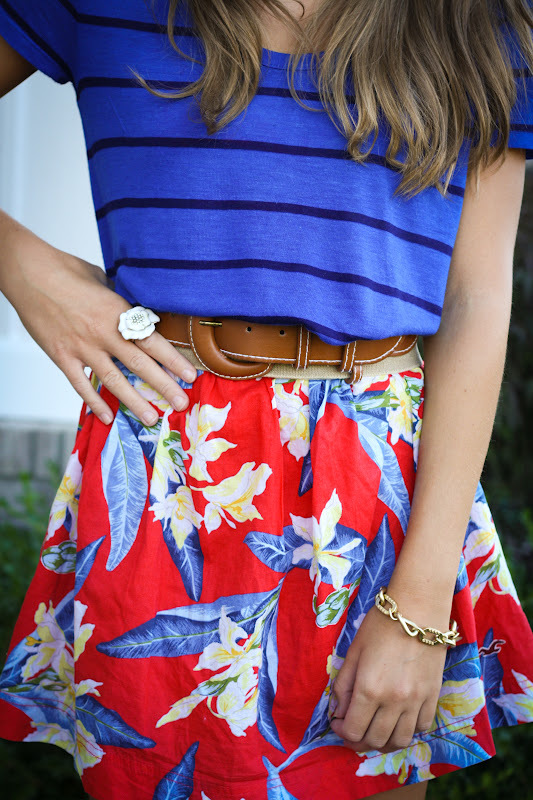 Cute skirt, it has a nice print! Adore your skirt, can't believe it's 4 years old! You are rocking that tropical print! The skirt looks amazing with the blue. I love how fun and energetic this outfit is. Great look! LOVE tropical prints ^^ The dresses u picked are gorgeous! Cute breezy summer outfit! I love that your top matches the skirt so perfectly and those wedges are awesome!! LOVE the mixed prints pretty lady!!! What an AMAZING find–4 years ago..INSANE! I agree, tropical prints are great for the summer and I love how you've put together this outfit, it's so bright and colourful! Great look. I like tropical prints. great way to mix patterns! I love this! Such fun colors and the Target wedges look great! Stunning outfit that skirt is amazing! i love your blog, how about following each other/? very daring! and I love it! keep it up. Oh this is so cute! tropical prints are the best!!! I love your blog!